The Psammonobiotidae is a family of shelled amoeboids that live in the interstitial habitat between sand grains. Most genera in the family are marine, though the majority of Campascus species inhabit fresh water (Nicholls 2003). Characters (from Nicholls 2003): Test covered with irregularly-shaped, flat particles, apparently of exogenous origin. Flared collar present surrounding oral aperture. [G86] Golemansky, V. G. 1986. 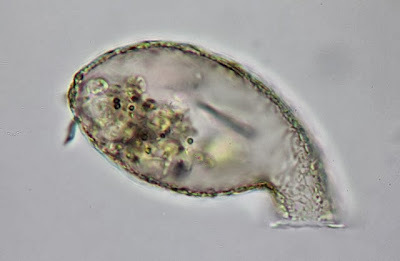 Rhizopoda: Testacea. In Stygofauna Mundi: A Faunistic, Distributional, and Ecological Synthesis of the World Fauna inhabiting Subterranean Waters (including the Marine Interstitial) (L. Botosaneanu, ed.) pp. 5-16. E. J. Brill / Dr. W. Backhuys: Leiden. [N03] Nicholls, K. H. 2003. Form variation in Campascus minutus and a description of Campascus simcoei sp. n. (Testaceafilosea, Psammonobiotidae). European Journal of Protistology 39 (1): 103-112.